NO ONE EXPECTS A PRINCESS TO BE BRUTAL. And Lada Dragwlya likes it that way. Ever since she and her gentle younger brother, Radu, were wrenched from their homeland of Wallachia and abandoned by their father to be raised in the Ottoman courts, Lada has known that being ruthless is the key to survival. She and Radu are doomed to act as pawns in a vicious game, an unseen sword hovering over their every move. For the lineage that makes them special also makes them targets. Lada despises the Ottomans and bides her time, planning her vengeance for the day when she can return to Wallachia and claim her birthright. Radu longs only for a place where he feels safe. And when they meet Mehmed, the defiant and lonely son of the sultan, who’s expected to rule a nation, Radu feels that he’s made a true friend—and Lada wonders if she’s finally found someone worthy of her passion. But Mehmed is heir to the very empire that Lada has sworn to fight against—and that Radu now considers home. Together, Lada, Radu, and Mehmed form a toxic triangle that strains the bonds of love and loyalty to the breaking point. From New York Times bestselling author Kiersten White comes the first book in a dark, sweeping new series in which heads will roll, bodies will be impaled . . . and hearts will be broken. I can't describe how intriguing I found AND I DARKEN to be. From what I've heard, it is not dissimilar to GAME OF THRONES. However, as someone who is neither fond of pirating or has HBO, I'm a little lost at that allusion at pop culture. But I can see parallels between Lada Dragwlya and Vlad the Impaler. It is not surprising when one considers the fact that the character of Lada is inspired by the author's own imagination of a female Vlad. The story and its plot showcases Lada, her brother (Radu), and Mehmed. The beginning starts off with Lada's childhood and her strained relationship with her father. It's a surprising place to begin, but it is incredibly relevant to Lada's characterization and character growth. In fact, Lada's rough and borderline cruel character contrasts sharply with Radu's softer nature. The contrast and differences between the two siblings is an unusual introduction, but it fits Lada and Radu perfectly and hints at their future. The setting is incredibly complex, and I feel as if I need more historical context, because there are many points in the book where I falter and wonder the "whys" of the background. Why do the Ottomans react a certain way to people from Wallachia? Why are the underclass of the Ottoman treated with a different standard? What are the politics behind the two different places? But the author graciously provides some context, which is more than enough to paint a bright, dark, and colorful picture of the Middle Ages. The author should be given cookies for setting up the story in a country that is not England, France, or Spain. The relationships and interactions between Lada, Radu, and Mehmed are fascinating to watch. The relationship between Mehmed and Lada alone is intensively complex with manipulation, love, and a bundle of other feelings. I can dive into the strange relationship between Radu and Lada, where familial feelings are not always enough to make up for the cruelest and seemingly heartless actions. It is the relationships that are pushed forward in AND I DARKEN and what truly gets me interested in the book. The ending leaves off at a dramatic point, and I can't wait to see how Lada evolves into a more dark version of herself. I will also look out for Radu and Mehmed interactions, because they truly are some of the high points in this novel. Overall, AND I DARKEN is a dark, fascinating novel. It's the type of book containing a controlled and planned car wreck we rubbernecks can't help but watch. I'll definitely keep my eye out for more of Lada's journey and her rise into power. 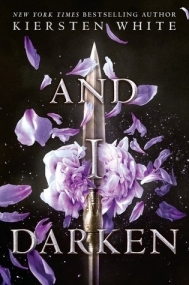 And I Darken is a compelling historical retelling that will stay on the minds of every reader who comes upon its pages. It's wildly dark and alluring, a fierce read that reimagines the life of Vlad the Impaler, but on the shoes of a young girl as vicious as a mighty dragon and her kind-hearted brother. This book constantly alternates between Lada's and Radu's POVs, meeting them in the early stages of their lives and following along as they are left in the Ottoman empire to secure the loyalty of their father, Vlad II Dracul, voivode of Wallachia. After several years of being privileged prisoners, Lada and Radu form a special bond with the future sultan of the Ottoman empire, Mehmed, yet are forced to survive in a cruel environment that will always see them as slaves. They rise, they fall, and rise again in a deadly world where they must sacrifice what they love in order to claim what is theirs. I was unfamiliar with the story behind Vlad III, Prince of Wallachia before reading And I Darken, so I couldn't tell then if it's historically accurate or not besides the gender switch, but after finishing it, I immediately researched about this enigmatic character since I was left highly fascinated with Lada and I wanted to know more. I'm still no expert on the subject, but I can see now how certain things were tweaked to fit the storyline better and in awe with the way Kiersten White pulled these changes. My favorite aspect of this book is how the author handles the character growth between Lada and Radu. Both characters start off as opposites and they remain that way throughout the story, but they each find middle ground in their strengths by the end of this installment. The way I would describe their dynamics is by picturing them as a seesaw or scale. In the beginning you can find Lada at the bottom since she is headstrong, defiant, ruthless and the one working hard to gain power. Meanwhile, Radu can be found at the top of the scale or dangling his feet up high on the seesaw, weightless for his gentleness and kind soul seeking to be loved and cared for. However, while the story progresses, they each level up and become stronger in their own ways, enhancing their skills and personalities for the better good. Another great thing about this book is how it portrays greatness, encourages gender identity and acceptance. How even back in those times where women were only viewed as wives and were replaceable, Lada manages to seek and forge her own power. Beauty is not on her side, yet this doesn't bring her down, even from finding someone worthy of her passion. She's not by all means a nice person, but she is someone that gains respect. The same goes for Radu, who wonderfully grows up into a charming man who works on accepting his preferences, and yet uses that uses this to his advantage, as a weapon. Although the pacing of this book comes off as slow, and at times uneventful, it doesn't ruin the chances for the reader to enjoy the story and to anxiously await its sequel. Kiersten White's captivating storytelling make a full comeback in this tale about birth rights, vengeance, slow-burning passion, and the odds of embracing what you are meant to be. Character development and identity acceptance. The first book in a new trilogy by author Kiersten White has been on my “waiting-to-be-released” list for some months, and I would stare at this list for minutes at a time, wishing that time will go faster so I could finally read it. I was so ecstatic when I finally got my hands on it and I devoured it in two days. And I Darken was everything I wanted in a book and more. It was based on rich history, with a strong, feminist protagonist, an incredible plot and written absolutely beautifully. Ladislav Dragwlya is the savage and wild daughter of Vlad Dracul, the prince of Wallachia. She is fierce, strong and more capable than any man, and ready to prove it. She and her younger brother, Radu, spend their days in her beloved Wallachia, vying for their father’s attention. Overnight, Lada and Radu are wrenched from their homeland and sent to be raised in the heart of the Ottoman Empire in the sultan’s court, to be held hostage for their father’s mistakes. Ruthless and brutal Lada detests her new prison and keepers and only desires to return home, but gentle Radu blossoms and finds himself drawing closer and closer to the call of Islam. The children become pawns in a political game and must learn to manipulate and charm if they have any hope of surviving. When they meet Mehmed, the illegitimate son of the sultan, their lives are changed forever. Lada is torn between her growing feelings for Mehmed and her desire to return home and claim her birthright. Radu gains position and power in the sultan’s court while trying to understand the different love he feels for Mehmed, stronger than that of a friend. Meanwhile, a dangerous threat hovers above the three and threatens to take everything they hold dear. Lada was an incredible character – I was so impressed by White’s ability to write an engaging, feminist woman who doesn’t allow men to make decisions for her or treat her like they treat any other woman of this era. Despite her savagery and, at times, cruelness, I felt like I could really connect with her, too. She has so much confidence but still suffers from the same anxiety and awkwardness any child at her age does, female or male. At the beginning of the novel, she is a child and the reader observes as she grows into a young woman who becomes even more determined to reclaim her destiny and birthright. Lada is actually based on a real historical figure, Vlad the Impaler, the vaivode (military prince) of Wallachia (modern-day Romania). The myth surrounding this real-life figure has changed so much over time: today, we are more familiar with the story of Vlad as Dracula, the vampiric ruler of Transylvania. While the real-life Vlad was certainly savage enough to inspire such stories, he was no vampire, but was just as scary. I am so excited for the next two books where White can explore Vlad’s savagery in the form of Lada. A real historical event I am dying to read is when Vlad impaled 20,000 of his own people on spikes and the invading Muslim army saw this, turned around, and went back home. I wonder if White’s version of Vlad will live up to the same name: Impaler. Radu, too, was a wonderful character. The younger brother of Lada, he is constantly overlooked due to his gentle and sweet nature, but he learns to use his good looks and innocent features to get what he wants. Mehmed was a tricky character – there were times I liked him, and other times I thought him selfish and annoying. He falls in love with Lada, who does not know if she returns his feelings (as much as he does), while Radu falls in love with Mehmed. It’s a sad love triangle, but an interesting one I look forward to watching develop over the next two books. In history, Radu actually becomes one of Mehmed’s male concubines, so I wonder if White will evolve Radu and Mehmed’s relationship to match their real-life counterparts. If so, this will have dire ramifications for Lada, if her brother and the man she thinks she loves, sleep together. The plot was fascinating. Beginning in childhood and progressing through their teenage years, we watch Lada and Radu grow up and come into themselves. The first book centers on Mehmed’s rise to become sultan, with Radu and Lada on the outskirts. The novel ended with a clear picture of Lada and Radu’s next journey. The first book sets up much of the rich history of the story, while the second book will almost certainly lead to action and war. I cannot wait to read the second book! Don’t know how I will survive an entire year of waiting.